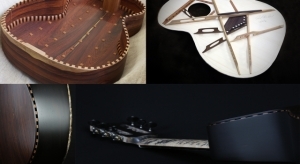 David Antony Reid is a true "hand-maker" of bespoke, contemporary and innovative stringed instruments. 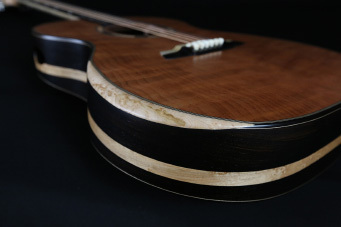 As an award winning luthier, David can take up to 400 hours to craft and sculpt each guitar - an approach employed due to strong feelings regarding a constant touch-and-feel understanding of the materials and construction method used. He believes aesthetics are important, but tone and feel are his ultimate interests. Each instrument is crafted as an individual using only the finest materials to their optimum, and very individual, potentials. I also use tap tuning and my very own tried and tested bracing pattern. This in union with my own bracing pattern, consisting of thin, high and sharp braces on the treble side of the instrument, then low, wide and rounded braces on the bass side, ensures an even tone production across the spectrum. On the thin, high and sharp braces I tend to hollow them out to allow the midranges to cut through. A blend of timbers is also used in the bracing to encourage an amalgamation of timbre. This is furthered with the blending of tonewoods used in the construction of my VaultBack models. In addition to this: on the upper bout of an acoustic guitar there is an area that is always under compression. 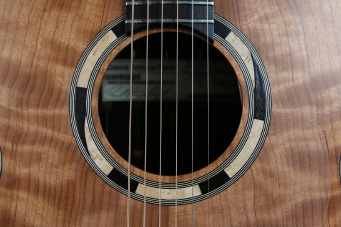 This is the area on either side of its sound-hole. 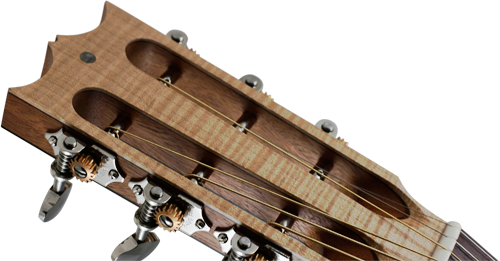 If you take notice of some old guitars that have been under string tension for their whole life, then you’ll see that the tendency is for their belly to pull up, due to the strings pulling up over the saddle, and for the neck to pull forward, collapsing the sound-hole area, due to the strings pulling over the nut. 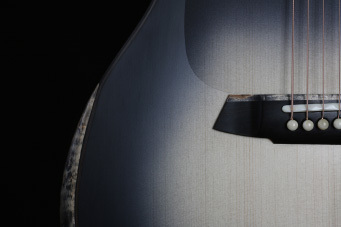 If you imagine that the top of a guitar is being compressed on the outside around the sound-hole due to this tension, then it stands to reason that, if the brace giving the guitar its main structural integrity on the inside of that area was hollowed out in the middle, then the high side of that brace would now be under tension, not compression; and since wood has a higher tensile strength than steel, this gives the structural strength that that area of the guitar top needs, yet still allowing it to be as flexible as possible. I do this as well as bracing the bass side of the main X brace with a formed bridge over the scalloping, this acts like a spring that drives the top, giving added bass and sustain. On my bridges I step the saddle slot 3mm or so further back towards the string-hole-side of the bridge than normal, and route the saddle slot right all the way through the bridge. Then I channel a further area out under the bridge all around the underside of the saddle slot, about 4-5mm on either side and about 1.5mm deep. This allows the saddle to go straight onto the soundboard and frees up the direct area around the underside of the saddle. Also, I mirror the compensation of the saddle onto the underside of the saddle so it's shaped to a point, further concentrating the energy from the strings onto the top. This direct transfer of sound has quite a difference on the impact of the string force. Ergonomic design is also high on my list: comfort bevels, my own invention of double-edged, scalloped fretboards and cantilevered necks are other additions I like to use on my instruments. And also, ports for monitoring are featured as standard. All of these individual differences contribute towards a more evolved approach in lutherie. 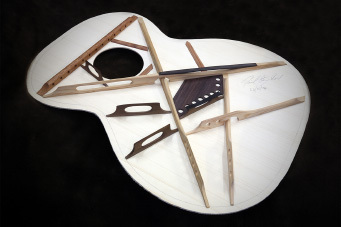 David builds some of the most unique and impressive guitars I have seen in my 44 years as a luthier. 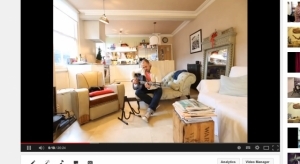 His workmanship is impeccable, and the guitars are simply superb. I hope and trust that as he deals with medical issues, he will still continue to make some of his outstanding instruments. Simply put, they are to be coveted. The VaultBack model is utterly breathtaking. This is a genuinely one-off master grade instrument: a privilege to experience! From one luthier to another Andy, your work is remarkable. Acoustic guitar can be a tricky instrument to record well, but since I got my David Antony Reid guitar - problem solved! It just seems to sit perfectly in the mix, without any of the lumpy, boomy tone I get with so many of the 'big name' acoustics. Martins, Gibsons, Guilds, I've had them all in my studio and this Reid guitar beats them all, hands down! Quite simply, David Antony Reid makes the best guitars I have ever played, and I cannot recommend them highly enough. They sound amazing, they feel fantastic, they look beautiful and the exquisite craftsmanship of The Gent makes it an absolute joy to play.